The shoulder is the most mobile joint in our body. However, a lot of us still suffer from chronically tight shoulders. Tight shoulders can cause a stiff neck and even more pain. A lot of our stiffness is due to poor posture when we sit, sleep or text on our phones. Below, are 4 exercises to open your shoulders and improve your posture, relieving any stiffness in your neck and shoulders. Place your right hand behind your back, grabbing onto a chair. If possible, interlock your fingers and make a fist. Pull your arm behind your back, then lean your head to the left. You should feel a good stretch in the right side of your neck. Stand, facing the wall. Interlock your fingers and bring your arms above your head, placing your elbows on the wall. This helps open the upper back, triceps, and shoulder joints. Hold for at least 30 seconds. Stand with your back against the wall and bring your arms to 90 degrees, palms facing forward. Slowly lift your arms up and down. Try to keep the elbows and wrists against the wall. 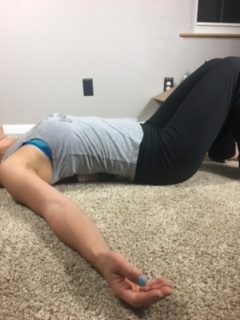 This can be a big stretch for the shoulders, chest and rotator cuff. If you feel any pain, back off and try some of the other shoulder stretches instead. Roll up a towel, blanket, bolster, or whatever you have. Sit on the ground and place the roll one hand-width behind your tailbone. Slowly lie back on the towel finding the “right” spot for you. It should feel comfortable. The roll shouldn’t dig into any of your organs or cause any discomfort. Let your palms face up and your shoulders open in a gentle way. Don’t let your head dangle off the roll. If you want a gentle neck extension, let the head rest on the ground. Lie here for as long as you’d like, preferably at least 5 minutes breathing into the expansion in your chest. BONUS: if it feels good, gently and very slowly rock your head side to side off the bolster. As with all yoga poses, listen to your body and be aware of any existing injuries. If anything causes pain, stop. You may feel gentle stretching but this is very different than pain. The shoulders are a delicate body part so don’t push them too far. You can do these poses as often as you like. When my shoulders start feeling tense (which is usually when I’m stressed at work! ), I like to do 1 or 2 of these for instant relief. Find what works best for you and stick with it for at least 1 month to notice a change in your posture and a decrease in your pain. Have fun! Are you ready to relieve your neck and shoulder pain? 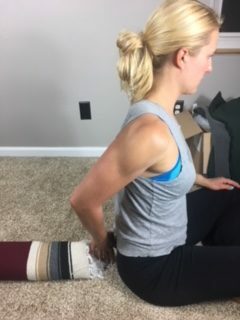 Attend my workshop in Grand Forks to learn stretches and strengthening exercises for the neck and shoulders.